More than 200,000 people a year visit this genuine California gold mining ghost town, where more than 170 buildings are protected in a state of "arrested decay" on more than 1,000 remote acres, administered by the California Department of Parks and Recreation. One little girl, whose family was taking her to the remote and infamous town, wrote in her diary: "Goodbye God, I'm going to Bodie." This phrase came to be known throughout the west. 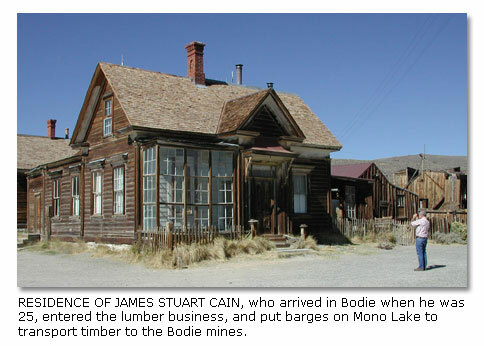 The town of Bodie rose to prominence with the decline of mining along the western slope of the Sierra Nevada. Prospectors crossing the eastern slope in 1859 to search for gold discovered what was to be the Comstock Lode at Virginia City and started a wild rush to the surrounding high desert country. By 1879, Bodie boasted a population of about 10,000 and was second to none for wickedness, badmen, and "the worst climate out of doors." One little girl, whose family was taking her to the remote and infamous town, wrote in her diary: "Goodbye God, I'm going to Bodie." This phrase came to be known throughout the west. 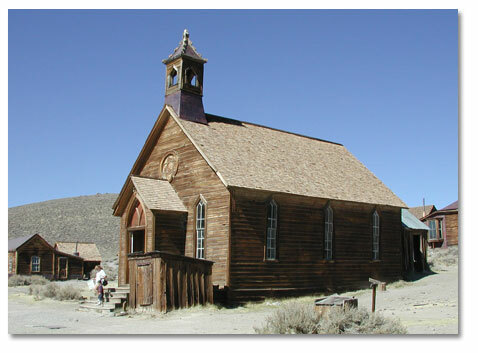 Killings occurred with monotonous regularity here in Bodie, sometimes becoming almost daily events. The fire bell, which tolled the ages of the deceased when they were buried, rang often and long. Robberies, stage holdups and street fights provided variety, and the town's 65 saloons offered many opportunities for relaxation after hard days of work in the mines. The Reverend F.M. Warrington saw it in 1881 as "a sea of sin, lashed by the tempests of lust and passion." Nearly everyone has heard about the infamous "Badman from Bodie." Some historians say that he was a real person by the name of Tom Adams. Others say his name was Washoe Pete. It seems more likely, however, that he was a composite. Bad men, like bad whiskey and bad climate, were endemic to the area. Whatever the case, the streets are quiet now. 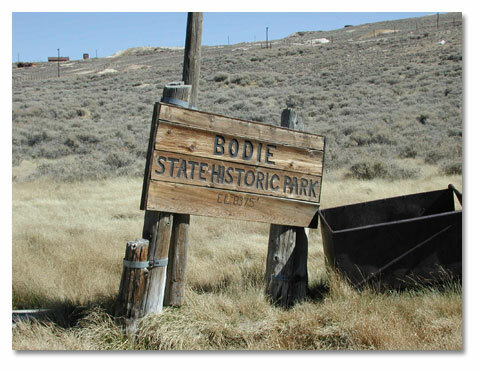 Bodie still has its wicked climate, but with the possible exception of an occasional ghostly visitor, its badmen are all in their graves. Only about five percent of the buildings it contained during its 1880 heyday still remain. 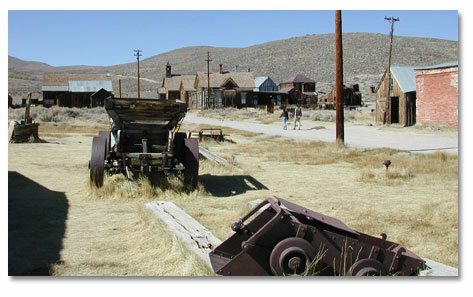 Today, it stands just as time, fire and the elements have left it -- a genuine California gold-mining ghost town. Designated a state historic park in 1962, it is now maintained in a state of "arrested decay." 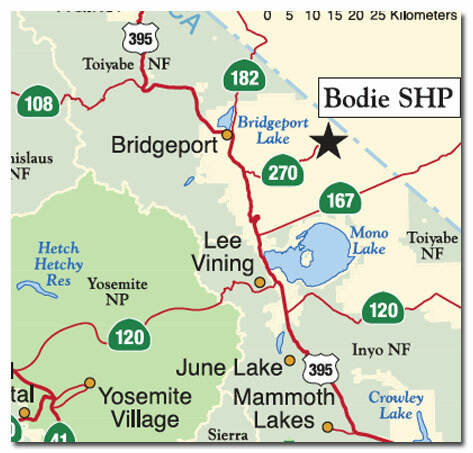 Bodie was named after Waterman S. Body (also known as William S. Bodey), who discovered gold here in 1859. The change in spelling of the town's name has often been attributed to an illiterate sign painter, but it was really a deliberate change by the citizenry to ensure proper pronunciation. You can see the Standard Mine and Mill on the west slope of Bodie Bluff. Because the old mill buildings and surrounding area are extremely unsafe, they are closed to the public. The mine was known as the Bunker Hill Mine when it was registered in July 1861. It passed through several hands before being sold for $67,500 to four partners, who changed the name and incorporated as the Standard Company in April 1877. 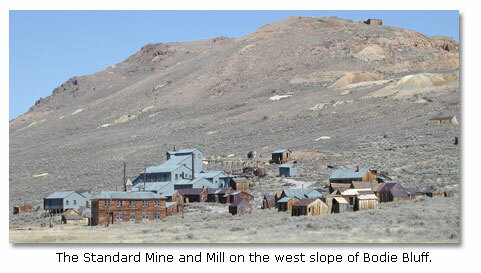 The Standard Mine yielded nearly $15 million over 25 years, and its success caused the 1878 rush to Bodie. In only a year, the population rose from about 20 to an estimated 10,000 miners, gamblers and other entrepreneurs. The mill was destroyed by fire in 1898, but was rebuilt the following year. While the boom lasted, some 30 companies produced $400,000 in bullion per month for an overall total estimated at $90 to $100 million. Many four wheel drive vehicles get stuck each year in the powdery snow that is deeper than it first appears. Spring thaws bring mud, and wheeled vehicles are not advised. TOWING FACILITIES ARE NOT AVAILABLE. Winter weather is often unpredictable. Sub-zero temperatures, strong winds and white-out conditions are not uncommon. Call 760-647-6445 for current conditions. 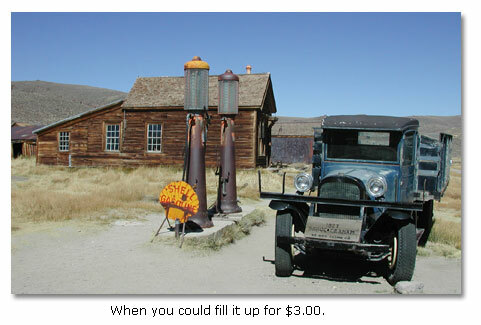 Only cash or personal/travelers checks are accepted at the park entrance station. Pets must be leashed. There are no services, camping, lodging, food vending or stores. There is one museum which is open during the summer. Books on Bodie and a few other items are available for sale. Restrooms (flush toilets) are located at the parking lot. At an elevation of 8,400 feet, it's hot during the summer, and potentially very cold during the winter. The weather can be changeable and layered clothing is recommended. From U.S. 395 seven miles south of Bridgeport, take State Route 270. Go east 10 miles to the end of the pavement and continue 3 miles on an unsurfaced road to Bodie. The last 3 miles can at times be rough. Reduced speeds are necessary. Call the park if there are any questions about road conditions.